Elder Edda | Vikings, Books, etc. A (finally completed) depiction of a moment that was left unrendered (but I think implicit) in Völundarkviða, one of my favorite poems in Poetic Edda. I have a general and short introduction to Poetic Edda in my post on the difference between Skaldic and Eddic poetry, though if you have a subscription to The Literary Encyclopedia I did the entries on Poetic Edda and Prose Edda. Jackson’s translation will join two other current English versions, Larrington’s Poetic Edda and Orchard’s Elder Edda (both translations of the same book, despite the difference in titles). The selling point for Jackson’s translation, according to Jackson’s own blog, is that it in a “truly readable, contemporary style,” written for casual readers outside the classroom. Not that Larrington or Orchard are intentionally trying to obfuscate the material, but I think that scholars who are used to teaching the material in the classroom (since I have noticed this myself–though of course Jackson teaches these things in the classroom as well) have a tendency to allow the “Oddness” of the material to shine through in translation. Personally, I think this is productive, at least in a classroom setting. As has been noted by scholars in a variety of disciplines (for example, archaeologist of the North Neil Price discusses this in his book The Viking Way, citing a scholar in Classic, if I remember correctly), while we might notice the “Other” (the explicitly different or monstrous relative to the culture of the text we are studying) or the “Queer” (that which “queers” or subverts the norm of the culture of the text), we often miss the “Odd,” the ways in which the text itself, a product of a different culture and semantic world than our own, resists our own attempts to “get it”–or, we may have the illusion that we “get it,” interpreting what we see in terms of our own horizon of expectations, until we hit a knot of indecipherability, where we come up against the alienness of the text, or our own alienness relative to the world the text comes out of and once spoke within. A translation which preserves some of this ambiguity and “Oddness” helps signal the student that it will take some effort to come to terms with the text, as well as reminding us that we can never wholly “master” it–it always speaks to use from another world, to some degree (actually, another lit-crit person and I recently had a bit of an argument with a linguist about just this topic with reference to biblical translation–I suspect that there might be a bit of a divide values-wise in this matter between those who study ancient texts primarily and those who study Language primarily…). None of this to say that I disagree with Jackson’s project–I’m really excited, actually, and curious to see how he handles the denser and weirder portions. My students have always struggled through the Helgi poems, for example, and the opening Völuspá can be super frustrating for neophytes (or anyone) with its allusiveness (an allusion is more frustrating than effective when we no longer know the reference). Meanwhile I hear Larrington’s translation is being reworked, so I’ll look forward to looking over all three eventually. It pays to be the instructor of record. Penguin sent me a complimentary copy of Andy Orchard’s new translation of Poetic Edda, presumably hoping that I would switch it out for Larrington’s Oxford UP translation. It’s a bit late, so I think I will stick with Larrington for now, but I will probably put Orchard’s book on the recommended reading list– if the students can’t read the Old Norse originals, then they can at least get a feel for the variety of ways certain passages may be interpreted. I haven’t gotten very far into it yet, but I think I will try to write a review for a journal (if I can find one that doesn’t already have a review lined up…) For now, here are some brief comments. The Ramsund stone from Sweden. From Wikicommons. The cover illustration is a close up of the Ramsund stone, specifically the spot where Sigurd is shoving his sword through the frame/Fafnir’s body. The story of Sigurd, Brynhild, etc takes up the second half of Poetic Edda, or the majority of the Heroic Poems. The title Orchard (or maybe Penguin) has chosen for the translation is The Elder Edda: A Book of Viking Lore. Sounds a bit melodramatic to me, but I suppose they are trying to capitalize on the idea of Edda as an arcane repository of ancient Germanic lore. Speaking of which, let’s clarify just what the eddas are. The name Elder Edda stems from the assumptions made when the primary manuscript (Codex Regius 2635 4to) was “discovered”. The text was owned by Bishop Brynjólfr Sveinsson of Skálholt in Iceland during the 1600s and was given as a gift to the king of Denmark (Iceland was ruled by Denmark until the 20th century). Brynjólfr believed that the text was that used as a source by Snorri Sturluson in his Edda, and so he called this “new” manuscript Edda as well. In addition he attributed this Edda to Sæmundr hinn fróði (Sæmund the learned), famous in legend, but known to have lived in the 1100s in Iceland, decades before Snorri. Thus this new Edda was often called Sæmundar Edda (The Edda of Sæmund), or the Elder Edda. 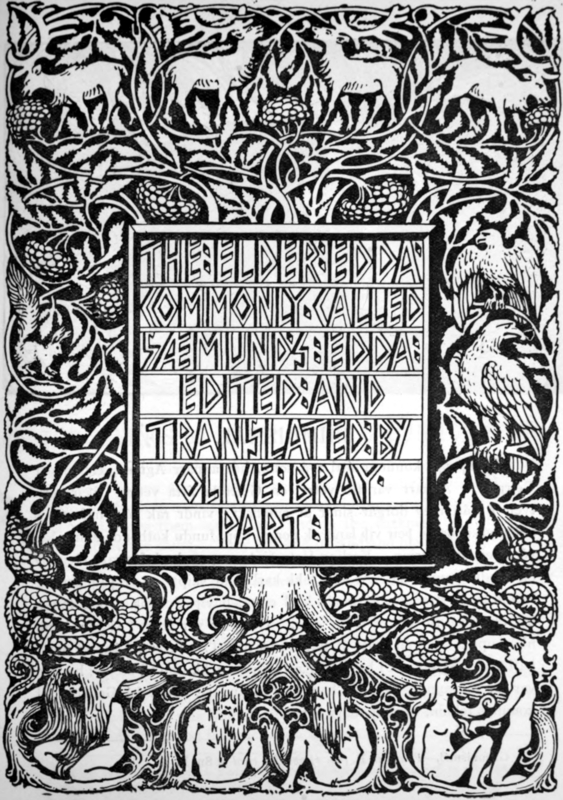 Olive Bray’s translation of Elder Edda. From Wikicommons. The manuscript actually dates to around 1270, whereas Snorri is thought to have written his Edda in the early 1200s (though our earliest manuscripts date to around 1300). I prefer the term Poetic Edda, since the bulk of the text is in poetry, while Snorri’s Edda I call Snorra Edda or Prose Edda, as the latter is mostly written in prose (although it is actually a book of poetics– in fact, the name may mean “poetics”). The term Elder is perhaps still defensible, even though Sæmundr is no longer thought to be the author/compiler. After all, Snorri quotes versions of some of these poems in the first section of his own Edda. Despite this, I prefer to stick with Prose versus Poetic. Elder versus Younger just doesn’t work so well when each of the poems in question has its own unique problems in dating. Some of the poems may ultimately date back to the Viking age, but it is a bit much to assume that they have survived the centuries unchanged, and it has been suggested that some of the poems were composed specifically for the 1270 manuscript. Well, more on what exactly the Eddas are some other time. For now, you can buy Andy’s book and get a good idea from his introduction. Speaking of which, the introduction is one of the big differences (well, not actually so big) between his translation and Larrington’s. Where Larrington spends most of her time introducing the mythological world which the first half of Poetic Edda deals with, Orchard focuses much more on the text itself. He covers the manuscript and its history in more detail, and instead of summarizing the mythology as a whole, he runs through the poems and gives a brief summary of each, along with comments relating to scholarship and modern reception– for example, in discussing the lacuna in the heroic poems, he mentions JRR Tolkien’s reconstruction of the missing lays (not intended as a scholarly piece, of course– Tolkien wrote his poems in English, after all). Orchard also includes a larger recommended reading list than Larrington’s translation, though how significant that is in a translation for the lay reader, I don’t know. Larrington’s translation gives an introduction to each poem, with notes on kennings in the margins and further notes in the back of the book. Orchard’s presentation is similar with the marginal notes and the end notes, but he saves the individual introductions for each poem for the end notes section as well. This allows him to give the poems as a continuous text, interrupted only by the titles. This is slightly closer to the presentation in the Codex Regius manuscript, except that in the manuscript the poems are not written out in stanzas, but in full-page lines just like the prose. The manuscript also lacks “titles” in our sense, giving instead notes like “about Volund”, “about Volund and Nidud” in the rubric. These are included in Orchard’s translation after the titles. As for the quality of the translations, I haven’t had time to look into that yet. I generally like Larrington’s book, though there are times when I am not so happy with particular notes or translations– but I expect that will be the case with any translation. Some parts of Orchard’s introduction look hurried to me– every now and then a sentence’s meaning seems garbled or unclear. For example, he references the possible “great-grandmother” etymology of Edda, but fails to explain why that term may have been used by Snorri (or later scribes) for his Edda. There were other bits, but I will wait to comment on them till after I’ve had a chance to read through the intro again. In any case, it is nice to have two full translations of Poetic Edda by quality scholars on the market. If you’d like to see the Codex Regius manuscript (our primary source for these poems, but not the only one), the Arnamagnaean institute has images online here. My earlier notes on the Eddas and reference material on Norse mythology can be found here. More on the Eddas later, and Eddic Poetry versus Skaldic Poetry. NEWS: Another Poetic Edda translation has been announced, this one aimed at a more general audience.